What should I expect when my bird/s stay at the Purring Parrot? 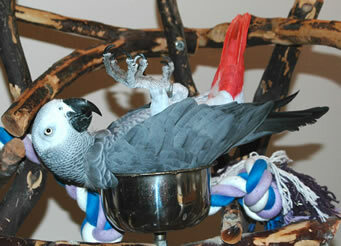 We cater to each individual bird's personality, care is not "one size fits all." The Aviary: All cages in our sound–proof display room are models of cages we have available for purchase, which can be good if you happen to need a new cage. This way your bird gets to try out the cage to see if they like it. All birds get their own cage. We have calming music being played as well as colorful décor. Some cages have a play-top for the bird that may not feel comfortable enough to go into the aviary and they can still get out and stretch their wings. The windows in the Aviary are double-paned glass. Aviary Room one and two: All toys and stands in the sound proof Aviaries are models that are available for purchase and your bird gets to try it out before hand. Our supervised Canopy room is an area where your bird can get out and play on their own stand. Play trees can accommodate toys which we encourage. We also have music, a HEPA air purifier and a daily misting baths to keep up humidity levels. All birds, if they choose, have ‘out of cage time’ for most of the day. If your bird is more comfortable just staying in his/her cage then that is okay too. The windows are double paned glass. The Décor and some included amenities: Both bird rooms have regular lighting, a one way window that looks outside as well as HEPA air purifiers to help keep the air clean of feather dust. Other amenities are foraging toys for treats (for a fee), communal interaction, head scratches, misting baths or a bathing bowl, unlimited fresh mix and a bedtime snack just to name a few things. At night all cages are covered to allow for a good night's sleep. Please don't forget to bring your birds favorite toys or we also have some for purchase. If you want to experiment with toy parts, give us a spending budget and we will be happy to make custom toys. 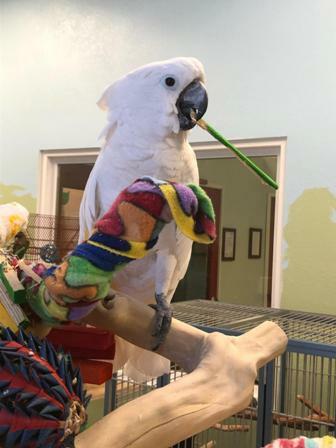 Extra Amenities: We also have a menu of extra goodies if your bird so desires, more elaborate foraging toys, fruit or veggie kabobs or chew and destroy toys, just to name a few. Prices can be found on our fee list. Do we offer play time and entertainment and does it cost extra? Yes we do and no it does not cost extra. Birds are curious and smart and we want to provide positive interaction with them by playing, talking and singing, head scratches or cuddling. Playtime is a communal affair and done at random times throughout the day. Food and Water: We serve premium foods such as pellets, seed/nut mix**, cooked grains, sprouts, fresh fruit, veggies, and homemade birdie muffins. All our water is from a reverse osmosis system. If the diet is hard to obtain then please bring it with you. If it is a prescription diet and since we are not a vet clinic, then you will have to bring it in. We understand that some birds have special feeding instructions so please feel free to bring foods that your bird is used. If you are okay with our foods then the daily meal plan is as follows: Breakfast: Sprouts and Banana. Lunch: A fresh mix of seasonal fruits, veggies, cooked grains, homemade birdie breads, greens, etc. Bedtime snack: Warmed sweet potato and banana mush, spoonfed of coarse. Nighttime cages have a dry mix of house blend seedmix and pellets. ** We do not serve or carrier peanuts so we can avoid aflatoxins, which can infect birds with Aspergillosis. Items from home: If your bird has a favorite toy, cage cover, or other things from home then please bring them. The more we can make them feel comfortable the better. Please remember that to bring your birds favorite toys so they have plenty to chew on. We also carry our own line of chew and destroy toys available for purchase. Medications: If your bird is on any medications then please bring them and the instructions. If your bird is diabetic or hard to medicate, we recommend they stay with their avian veterinarian. If your bird is handicapped or elderly and needs special care or accommodations please let us know ahead of time so we can have things ready. Shy birds: We understand that not all birds want attention from people they do not know and need time, sometimes a lot, to warm up. We will never force your bird to come out and socialize or be touched. Everything happens on their terms not ours. We know that some birds just enjoy the company but not the touch. Daily weight checks: If you would like your birds weight checked and if your bird allows we will weigh them upon check-in and then daily thereafter. If there weight fluctuates more than 10% we will call you ASAP and get them to their veterinarian, if available and if not, to the nearest avian veterinarian. Emergencies: If your bird has an emergency we will contact you ASAP as well as get them to their vet, if available and if not, to the nearest emergency clinic. If you will be unreachable we will need you to keep a credit card number on file with us. Transport charges are listed on our fee list. Email updates: We will be happy to send you email updates on your bird at no charge. For $2 a photo we can also send email photo updates. We also have webcams in each room. Viewing is from 9-6 daily. Webcams have pan/tilt ability too! Arriving and Departing: All birds must arrive in a carrier, cage or harness and leave in a carrier, cage or harness to prevent escape, conflicts with others or anything else that could happen. Flighted birds: Flighted birds are not a problem as long as they stay on their own cage or playstand. If they bully/bite other birds or tend to get down to start their own remodeling projects to items that are not theirs then they will have to stay in a cage. Communal Lodging: We want to make sure that we have only healthy birds staying with us so we have placed some guidelines to help us try and keep things clean, healthy and fun place for our guests. These measures are put in place to protect your birds as well as others. All birds, whether day boarding or staying overnight, must have been tested for the following found below. If your bird was tested and then exposed to other unknown or untested birds then they will have to have updated tests. All testing must have been within the past 6 months. PBFD: Psittacine Beak and Feather Disease. (Required for Old World Birds) within the past 6 months of staying with us. Psittacossis. (Required for all birds) within the past 6 6 months of staying with us. Polomya if under 6 months of age. There is controversy whether birds should be vaccinated or not so we will defer to your avian vet to see if they think it is necessary or not. An annual veterinary exam in the past 12 months. We will need you to either bring verification from your vet or have them fax over the lab results. All arrivals and departures are done by appointment only and if you are a new client this will take about 30 min. or longer if you have a number of birds. We want to give you and your bird our undivided attention to fill out your bird’s profile of likes, dislikes, preferences, etc. Plus we will need your information. We will then show you to where your bird will be staying so you can help them settle in. Visiting before you need us: It is always recommended that you come and look at a potential place where your bird might be staying. We welcome and encourage this. If you like what you see then we can go ahead and get your paper work ready ahead of time. This way when you arrive we can just take you directly to settle your bird in. This can really help things out on the day of your departure and you will need to do less rushing around.